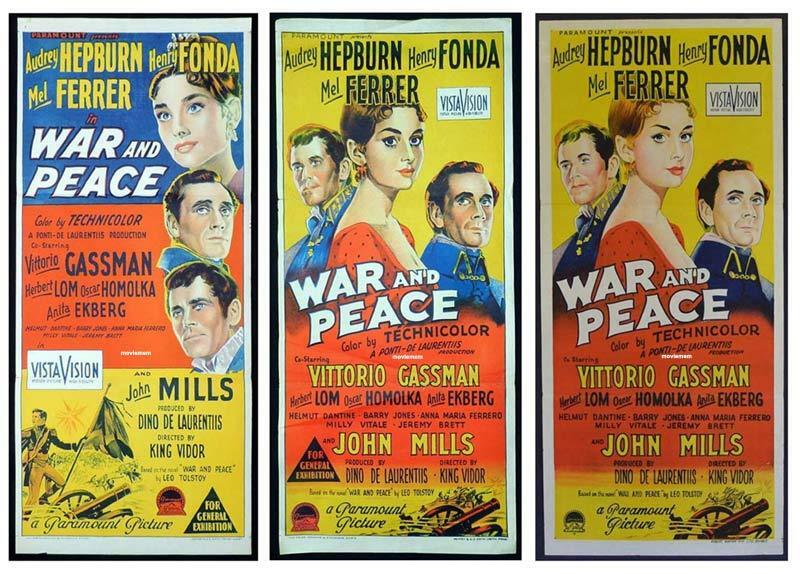 News | Moviemem Original Movie Posters - WAR AND PEACE Daybill Movie poster Original or Reissue? Collectors need to be careful when buying Australian daybills. It is always best to buy from a reputable dealer as casual sellers often unknowlingly misrepresent daybills as original when they are actually resissues or second printings. A case in point is the Audrey Hepburn daybill War and Peace. Two Richardson Studio daybills were printed for the original release of the film and both were printed by W.E.Smith. A very similar daybill to the yellow version was printed by Robert Burton in the late 50s or very early 60s for the re release. At first glance, the two yellow daybills look identical but if you look closely you will see that the Paramount logos are different and, of course, the printers details at the bottom are also different. Note that the Robert Burton printed daybill also has no censorship details and no credit to The Richardson Studio as the artist. So, if you want an original first release War and Peace daybill, look for the W.E.Smith printers details at the bottom of the poster. The two original W.E. Smith printed War and Peace daybills are pictured first with the reissue Robert Burton printed daybill on the far right.